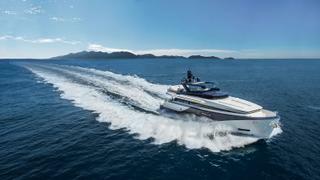 Brazilian yard MCP Yachts has revealed that its MCP THD 925 has now been launched. Now named Ragnar, the 27.74 metre in-house design has been built entirely from aluminium with a 7.15 metre beam and a maximum draught of 1.85 metres. As the first look images below show, the exterior styling of the THD 925 features a bold colour scheme. 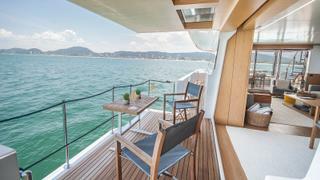 Elsewhere, the superyacht features a fold-out owners' balcony. 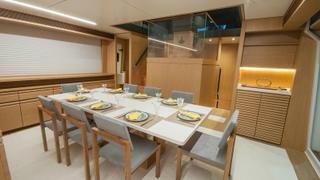 Interior accommodation on the MCP THD 925 is for up to 12 guests split across six cabins, including a main deck master suite, two doubles and three twin cabins. Two crew cabins meanwhile allow for a staff of four and feature separate access on the portside of the engine room. The yard adds that it will be offering a four-cabin and a five-cabin alternative on any future models. 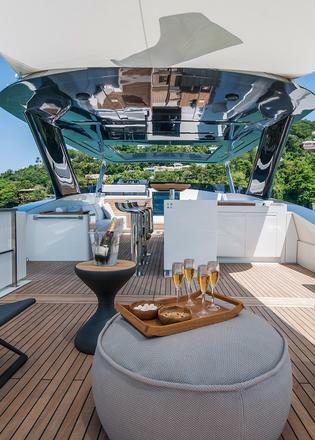 Moving outside the expansive superyacht sundeck features a hardtop bimini, a barbecue and bar area. Tender storage aft is accessed via a built-in davit crane. MCP Yachts can fit the THD 925 with a range of engine installations. The owner of the first hull has opted for twin 1,925hp Caterpillar diesel engines for a top speed of 27 knots and fast cruising speed of 23 knots. When cruising at 10 knots, the THD 925 will boast a maximum cruising range of 3,000 nautical miles, thanks to its total fuel capacity of 14.850 litres.